Ferroelectric non-volatile memory; boosting wireless capacity; thermophotovoltaic power. Scientists from the Moscow Institute of Physics and Technology (MIPT), the University of Nebraska, and the University of Lausanne in Switzerland succeeded in growing ultra-thin (2.5-nanometer) ferroelectric films based on hafnium oxide that could potentially be used to develop non-volatile memory elements called ferroelectric tunnel junctions. The film was grown using atomic layer deposition. Non-volatile memory based on ferroelectric tunnel junctions is a promising development that has not yet been fully implemented. A ferroelectric is a material that is able to remember the direction of an externally applied electric field by the residual polarization charge. 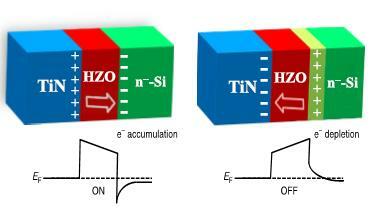 Thin-film ferroelectrics have for a long time been used to make non-volatile memory devices, however it is extremely difficult to miniaturize them in order to achieve high density/storage capacity and, in addition to this, they are made of materials that are incompatible with the production processes used in modern microelectronics. Ferroelectrics are generally insulators and do not conduct electricity. However, if the ferroelectric layer is very thin, electrons can slip through with a certain probability, thanks to the quantum tunneling effect. The probability of tunneling depends on the size and shape of the potential barrier (the energy characteristics of the structure), and the electrons that pass through create a tunnel current. The movement of the electrons in this case is similar to an obstacle course race, and the size of the obstacle is determined by the direction of the polarization vector, which alters the shape of the potential barrier. Information is written by applying a voltage to the electrodes next to the ultra-thin ferroelectric, and it is read by measuring the tunneling current. In theory, this type of memory may have an extremely high density, fast reading and writing speeds, and a low level of power consumption, potentially becoming a non-volatile alternative to DRAM. Memory based on ferroelectric tunnel junctions will be able to save power, which is especially important for portable devices that run on batteries. However, previous prototypes of devices based on conventional ferroelectrics have not been compatible with silicon technology. While hafnium oxide is already used in the production of modern silicon logic chips, a few years ago ferroelectric properties were discovered in one of its modifications. In their study, the scientists from MIPT succeeded in growing an ultra-thin, tunnel-transparent film of this material on a silicon substrate, while maintaining the ferroelectric properties. If ferroelectric tunnel junctions based on hafnium oxide are developed, the team hopes they will be able to demonstrate memristor properties for use in neuromorphic systems. Last year, Columbia Engineering researchers created full-duplex radio integrated circuits that could be implemented in nanoscale CMOS to enable simultaneous transmission and reception at the same frequency in a wireless radio. That system required two antennas, one for the transmitter and one for the receiver. Now the team developed the concept further to only require one antenna for an overall smaller system and making it the first time researchers have integrated a non-reciprocal circulator and a full-duplex radio on a nanoscale silicon chip. The group has been working on silicon radio chips for full duplex communications for several years and became particularly interested in the role of the circulator, a component that enables full-duplex communications where the transmitter and the receiver share the same antenna. In order to do this, the circulator has to “break” Lorentz Reciprocity, a fundamental physical characteristic of most electronic structures that requires electromagnetic waves travel in the same manner in forward and reverse directions. The traditional way of breaking Lorentz Reciprocity and building radio-frequency circulators has been to use magnetic materials such as ferrites, which lose reciprocity when an external magnetic field is applied. But these materials are not compatible with silicon chip technology, and ferrite circulators are bulky and expensive. 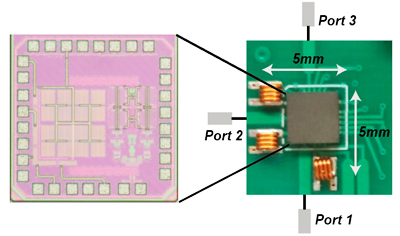 The team was able to design a highly miniaturized circulator that uses switches to rotate the signal across a set of capacitors to emulate the non-reciprocal “twist” of the signal that is seen in ferrite materials. Aside from the circulator, they also built a prototype of their full-duplex system, a silicon IC that included both their circulator and an echo-cancelling receiver. Non-reciprocal circuits and components have applications in many different scenarios, from radio-frequency full-duplex communications and radar to building isolators that prevent high-power transmitters from being damaged by back-reflections from the antenna. The ability to break reciprocity also opens up new possibilities in radio-frequency signal processing that are yet to be discovered. Full-duplex communications is of particular interest to researchers because of its potential to double network capacity, compared to half-duplex communications that current cell phones and WiFi radios use. The group is already working on further improving the performance of their circulator, and exploring “beyond-circulator” applications of non-reciprocity. Physicists at the Australian National University and UC Berkeley discovered radical new properties in a nanomaterial which opens new possibilities for highly efficient thermophotovoltaic cells, which could one day harvest heat in the dark and turn it into electricity. 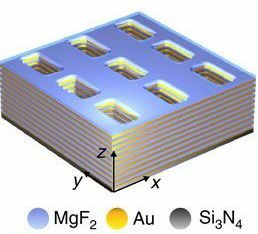 The team’s metamaterial, made of tiny nanoscopic structures of gold and magnesium fluoride, radiates heat in specific directions. The geometry of the metamaterial can also be tweaked to give off radiation in specific spectral range, in contrast to standard materials that emit their heat in all directions as a broad range of infrared wavelengths. This makes it ideal for use as an emitter paired with a thermophotovoltaic cell. “The size of individual building block of the metamaterial is so small that we could fit more than twelve thousand of them on the cross-section of a human hair,” said Dr. Sergey Kruk from the ANU Research School of Physics and Engineering. The key to the metamaterial’s remarkable behavior is its novel physical property, magnetic hyperbolic dispersion. Dispersion describes the interactions of light with materials and can be visualized as a three-dimensional surface representing how electromagnetic radiation propagates in different directions. The dispersion of the new metamaterial is drastically different and takes hyperbolic form, compared to natural materials, such as glass or crystals, whose dispersion surfaces have simple spherical or ellipsoidal forms. The team believes the efficiency of thermovoltaic cells based on the metamaterial can be further improved if the emitter and the receiver have just a nanoscopic gap between them. In this configuration, radiative heat transfer between them can be more than ten times more efficient than between conventional materials.